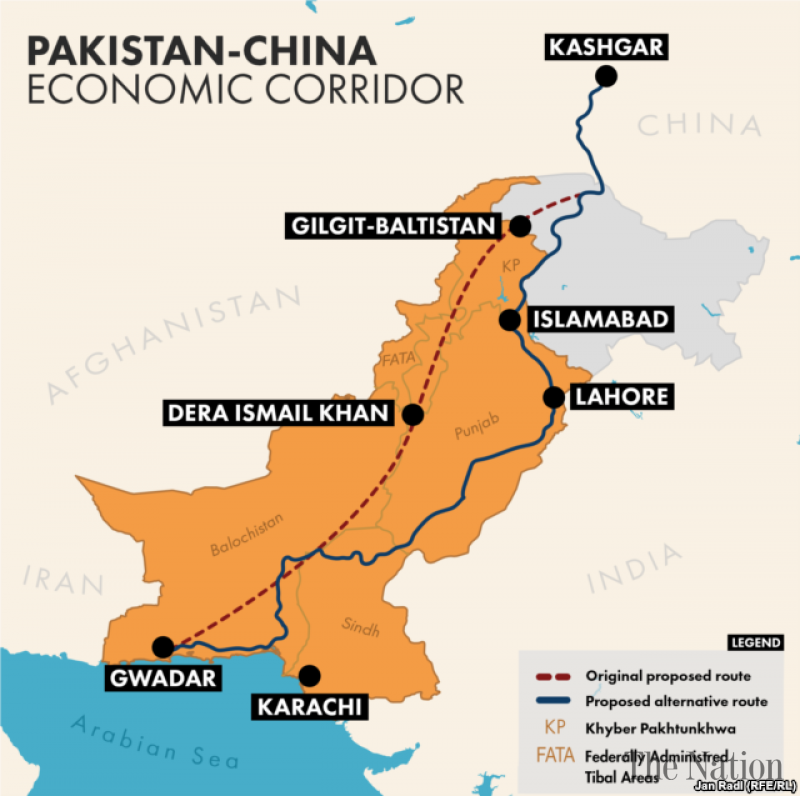 Last week, I wrote an article which presented a case about Punjab being the biggest beneficiary of China-Pak Economic Corridor (CPEC) at the expense of smaller provinces. Amar Jajja wrote a rebuttal and termed my genuine criticism as anti-Punjabi slur. Just like any criticism on Muslims is termed as Islamophobia, similarly, any genuine criticism on Punjab is quickly labeled as Anti-Punjabi slur. The said article has cherry-picked some of points in my article and twisted them to present a case against my stance. First I would respond to the incorrect points raised in that rebuttal and then further elaborate why CPEC is indeed China-Punjab Economic Corridor. Amar Jajja writes that Punjab gets 39% share from the $28 billion projects of CPEC despite having 60% population of Pakistan. He implies that just because Punjab is not getting 60% of the project then CPEC is not Punjab centric. Whenever it comes to development planning, projects are distributed based on the backwardness not on population. Less developed provinces of Pakistan should get the lion’s share of projects but Punjab is the biggest beneficiary with 39% share. Author mentioned the share of Sindh which is $9 billion but he conveniently ignored the share of Balochistan which is 0. So, when Punjab gets $11 billion from CPEC and the most backward province of Pakistan, Balochistan, gets nothing, is it not right to call CPEC as China-Punjab Economic Corridor? Secondly, Amar Jajja maintains that I have mentioned three projects and drawn general conclusion out of them. Again, he deliberately avoided mentioning the name and nature of these projects. These projects are not ordinary projects and include the $1.6 billion Orange Line Mass Rail transit system for Lahore. Lahore already has a Metro Bus service; would it not be fair to allocate this project to Karachi, the largest city in Pakistan? A branch of Industrial and Commercial Bank of China would be established in Lahore; would it not be fair if it were established in Quetta or Gwadar? Lahore is the single largest recipient of the urban projects in CPEC, and yet calling the project Punjab-centric is a mistake? Thirdly, the author mentions that if Lahore-Karachi Motorway is meant for Lahore then Gwadar-Kashghar route is meant for Gwadar. This statement reflects complete ignorance about the dynamics of Gwadar. Lahore-Karachi motorway is being financed through CPEC to use it as a permanent route for this corridor. That’s why it’s meant for Lahore because it will ensure that CPEC route passes through the city in the future. National Highway that connects Karachi to Lahore is in pretty good shape as compared to Highways in Balochistan and Khyber Pakhtunkhwa (KP). First priority should have been to develop motorways in the two western provinces but that is not the case. Federal Minister Ahsan Iqbal said that the existing Quetta-Surab road would be extended to Gwadar and it would connect Quetta to CPEC. Quetta-Surab Road is a one-lane broken road and that would be extended till Gwadar. This is what Balochistan would get and Punjab gets a state of the art Lahore-Karachi motorway from CPEC. Moreover, the author has criticized the thankless attitude of people of Balochistan by stating that Khuzadr-Ratodero Motorway would be financed by federal government and it should be appreciated rather than loathed. For his kind information, Motorways are always financed by the federal government as they are federal subjects. That’s just an example of twisting facts to make a point. Coming back to the main point, CPEC serves as an umbrella for four categories of projects. These categories are Gwadar Port, Infrastructure, Energy and Economic Zones. The Gwadar port project is the starting point of this corridor but it’s not getting a single penny for its socio-economic development from the $28 billion. It’s a fact that Lahore as a city would benefit much more than Gwadar, which is the reason that Pakistan is getting $46 in first place. The second part is the rail road projects that would connect Gwadar with Kashghar. It has become crystal clear that the federal government is hell bent on preferring the eastern route over the western route. Developing Karachi-Lahore Motorway and inferior roads in Balochistan is part of that agenda. As a part of CPEC, several economic zones would be established in Pakistan to enhance economic activity. Mysteriously, the federal government has not disclosed the exact location of these economic zones. This has led the politicians of Balochistan and KP to allege that the majority of these economic zones would be allocated to Punjab. This concern seems to be justified because if these economic zones were evenly distributed among all provinces, then Ahsan Iqbal would have proudly mentioned it to debunk the claims of CPEC being Punjab centric. That’s yet another reason to believe that federal government is trying to benefit Punjab at the expense of other provinces. I agree with Amar Jajja on the point that CPEC must not be kept under wraps and eastern route should not be prioritized over the western route. However, the federal government is doing whatever it clan to give preference to the eastern route and that’s the main source of controversy. Kalabagh Dam was not made controversial by the smaller provinces, it became controversial due to its inherent nature; benefiting Punjab at expense of other provinces. If the Punjab centric nature of CPEC is not revised the CPEC would end up being too controversial for Pakistan’s benefit. Rather than blaming the victims for protesting, everyone who is concerned about the prosperity of Pakistan should oppose the Punjab-Centric nature of CPEC.